Below are excerpts and images from the Alaska State Museum treatment report for a doll recovered from a shipwreck, posted here to stimulate conversation about the identification of the doll and its treatment options…. Doll recovered from a 1901 shipwreck, possibly made of gutta percha? Dimensions: 22cm tall, 11cm wide, 6cm deep, 6.5cm diameter head, rubber is 2mm thick where observed in cross section. Background Info: Doll recovered from a gold rush era shipwreck in Alaska in the summer of 2012. Ship sank in 1901, making the doll over 113 years old. At least five children were known to have been passengers on the ship, and some of them drowned. The doll seems to be made of gutta percha or another natural rubber product. 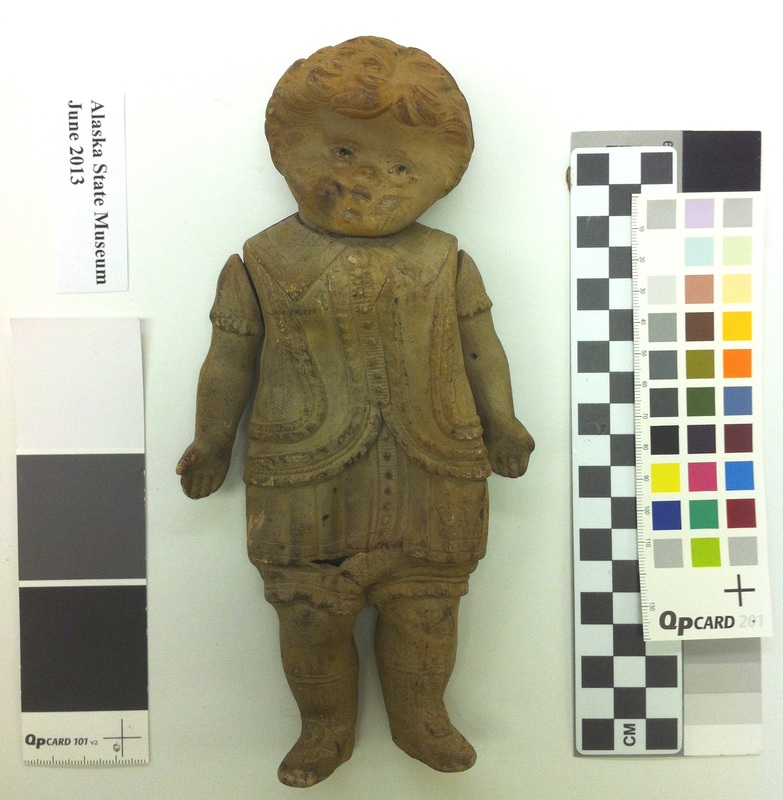 Since these materials tend to deteriorate with time, exposure to oxygen and exposure to light, could this be one of the best preserved dolls of its type, given its protection from agents of deterioration between the years 1901 and 2012? Description: Hollow doll with jointed arms and head. The doll’s garments are molded into the material: a vented jacket with a wide collar, a long buttoned shirt (or perhaps a peplum) and short pants that end above the knee. The brocade rope- like detail suggests a military-style jacket and therefore perhaps a male doll. Textured socks and shoes with a strap over the top and a flower-like element are molded to the feet. A small peanut-shaped maker’s mark on the front proper left of the doll’s jacket measures 1.0 x 0.5cm and is difficult to read. There are at least four, perhaps five letters. The second letter is most likely a Y or an X but perhaps a K. The third letter may be an R. The whites of the eyes of the doll appear to be white paint, and the eyebrows also appear to be painted on. Other areas of possible paint may be the lips and the hair, but deterioration makes certainty difficult. The doll has a large hole at the center of the back, much like a squeaky toy (although those were not popular until the mid-20th century) as well as smaller holes at the back of the head near the neck and a small hole in each arm. Technology: The doll seems to be made of gutta percha, a plant-derived natural polymer similar to latex or rubber. It was popular for use in insulating undersea cables, as the properties of gutta percha prevented biological growth in addition to being a good insulator. This was the case from roughly the 1870’s until the 1930’s when the supply of gutta percha began to dwindle and other polymers rose to take its place. Another popular use for gutta percha was golf balls or “gutties” starting in the mid-nineteenth century. Golf balls were formerly made of a hand-stitched leather skin stuffed with feathers known as a “featheris”. Gutties were cheaper and more durable, as featheries proved useless when wet. Gutties were observed to fly farther and with more accuracy when they were chipped, nicked and dinged, leading to the invention of the dimpled golf ball. Today the major commercial use of gutta percha is for the slim peachy-colored “gutta purcha points” used as a fill material for the emptied root canal in dentistry. Once the root canals are filed smooth, the empty voids are packed with this inert, natural substance and the tooth is filled or crowned. The manufacture of this doll is described in the 1883 book, “A Practical Treatise on Caoutchouc and Gutta Percha” by Raimund Hoffer. “Among the many articles manufactured from rubber, the production of dolls and toys has become an important branch of the rubber industry, as, on account of their indestructibility and softness, they are especially adapted for children’s toys. These articles have of late been improved so much that, as far as beauty of form is concerned, they may be called small works of art, and, in fact, such figures are at present frequently used for ornaments in rooms. Small articles of this kind for instance, human figures are pressed from vulcanized caoutchouc in forms of metal, so that the figure is obtained in two halves each a few millimetres thick. These are joined together by a solution of caoutchouc, so that they form a hollow body, and are then burned. But the air inclosed in the figure would expand it so much during the burning process that it would burst. To prevent this a small hole is made in some part of it through which the air can escape, and this, after the burning, is closed by a small cork of caoutchouc dough. Such figures are also prepared from sheets of vulcanized caoutchouc-mass and by using moulds of type metal. The sheets are cut with a pair of scissors into suitable shapes and lightly pressed into the mould ; this is then closed so that both sheets join together. But before the mould is pressed together tight, a few drops of water are poured into the interior of the article. When the mould prepared in this manner is exposed to the heat of the burning apparatus, the water inclosed in the caoutchouc-mass is changed into steam which forces the sheets apart, so that all cavities of the mould are filled up. When the articles are taken from the mould, which must be done while they are still hot, a small hole is made in them to allow the air to pass into the interior and to prevent them from collapsing while they are cooling off.” (pp 214-216). Condition: The face of the doll is sunken in, with the head no longer completely round. There is a 2 cm horizontal tear through the doll at the bottom of the shirt/peplum to the PR of center. If the holes had ever been plugged, the plugs are now gone. Minor overall abrasions and scratches that might be from wear during use or may be from deterioration post-wreck. PR check is slightly blackened. Doll is a pale warm gray color, also may be described as taupe, a grey-tan color. Small overall pattern of cracks. Treatment: The doll was found waterlogged, and kept wet from summer 2012 until March of 2013 with occasional changes of fresh water and two changes of distilled water for purposes of desalination. Loose dirt was brushed from the surface with a small artist paintbrush while still underwater. In March 2013, the doll was removed from water, photographed, and allowed to slowly air-dry. Doll was observed for three months, and then packaged in an anoxic environment using a transparent Escal Bag with 8 sachets of RP 3K. The bag was then enclosed in an outer bag of Escal with an additional 8 sachets of PR 3K. Hand held heat sealer was used. Double bagging was done to maximize the integrity of the oxygen-free environment. Enough excess was incorporated on the outer bag to permit opening and re-sealing if the doll was exhibited in the inner bag. Anoxic environment was chosen to slow the deterioration of the material from exposure to oxygen. Artifact will be kept in a box to slow deterioration from exposure to light. Escal Transparent ceramic barrier film used in combination with oxygen absorbers to create an anoxic storage environment. 5m x 1m sheet $95 in 2013. Available from Keepsafe Microclimate Systems (Jerry Shiner) A division of Object & Textile Conservation Systems Ltd. 9 Oneida Ave, Toronto, Ontario, Canada M5J 2E2. www.keepsafe.ca 1-800-683-4696. PR 3K Oxygen absorbers (RP system) with moisture neutral properties (Type K).manufactured by Mitsubishi, used with barrier film to creat an anoxic environment. Advertised to reduce the oxygen to extremely low levels within hours. 25 sachets $85 in 2013. Systems Ltd. 9 Oneida Ave, Toronto, Ontario, Canada M5J 2E2. www.keepsafe.ca 1-800-683-4696. You are currently browsing the Ellen Carrlee Conservation blog archives for June, 2013.